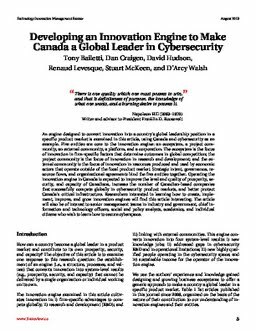 An engine designed to convert innovation into a country’s global leadership position in a specific product market is examined in this article, using Canada and cybersecurity as an example. Five entities are core to the innovation engine: an ecosystem, a project community, an external community, a platform, and a corporation. The ecosystem is the focus of innovation in firm-specific factors that determine outcomes in global competition; the project community is the focus of innovation in research and development; and the external community is the focus of innovation in resources produced and used by economic actors that operate outside of the focal product market. Strategic intent, governance, resource flows, and organizational agreements bind the five entities together. Operating the innovation engine in Canada is expected to improve the level and quality of prosperity, security, and capacity of Canadians, increase the number of Canadian-based companies that successfully compete globally in cybersecurity product markets, and better protect Canada’s critical infrastructure. Researchers interested in learning how to create, implement, improve, and grow innovation engines will find this article interesting. The article will also be of interest to senior management teams in industry and government, chief information and technology officers, social and policy analysts, academics, and individual citizens who wish to learn how to secure cyberspace. Bailetti, A.J, Craigen, Dan, Hudson, David, Levesque, Renaud, McKeen, Stuart, & Walsh, D’Arcy. (2013). Developing an innovation engine to make Canada a global leader in cybersecurity. Technology Innovation Management Review.